Tawana Weicker sits in the café at Katuah Market in Asheville, having just made a delivery. She’s pleased to see people rubbing their hands dry as they exit the restrooms, which likely means they used her soaps by the sink. It’s no coincidence that the market is a big point of sales for Warhorse, Weicker’s Columbus-based business that emerged almost by chance a few years ago. While these products are making a consumer splash, Weicker’s multipurpose cleaner and leather soaps derived from biodiesel fuel are what are really making waves among research scientists, educators, and students. Here, her chief ingredient is glycerin, or glycerol, a molecule found in animal fats and vegetable oils that’s been used in soap making for thousands of years because of its skin nourishing and moisturizing properties. Glycerin is also the major by-product in the manufacturing of biodiesel, a popular alternative fuel made from recycled cooking oil. Because it is expensive to refine, glycerin as a waste product has had little commercial value. Given the boom in biodiesel production in recent years, there’s been a glut of glycerin, prompting scientific investigations into its disposal and uses, which have included compost and livestock feed. 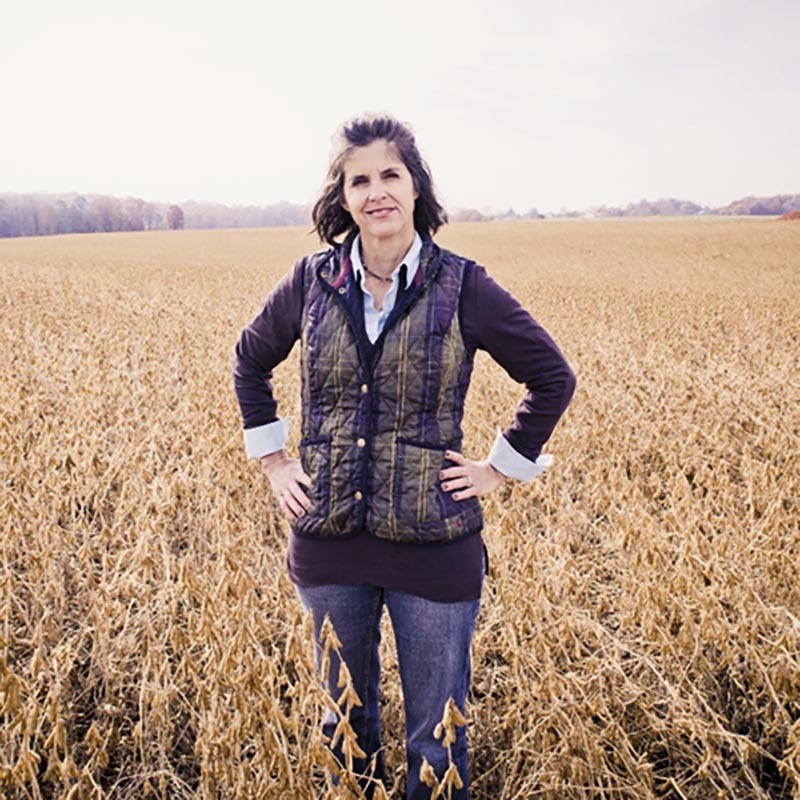 But no one, to the best of Weicker’s knowledge, has attempted to find a use for biodiesel-based glycerin on the national scale to which she aspires. Weicker grew up in a family of farmers in Polk County’s Pea Ridge community. They made full use of what they had, including each other. If someone needed help picking beans or shucking corn, making preserves and canning, everyone pitched in, she recalls. Learning to do for herself and her family is how she got into the soap business. An English teacher at Polk County High School for 14 years, Weicker took an interest in biofuels in 2007, when one of her students was tackling the topic for a senior project. Weicker, driving a diesel Volkswagen Passat at the time, consulted with the student’s project mentor to learn how to make biodiesel from the spent cooking oil she collected from area restaurants. The more she made it, the more she contemplated making something out of the glycerin by-product. There was little research to guide her. “There were no benchmarks, no testing guidelines. Nothing had been done,” she says. “I talked to the Environmental Protection Agency, the Food and Drug Administration. There were labs across the country, but there weren’t many chemists that could give me feedback.” Ultimately, she learned how to make glycerin soap by watching online tutorials—“lots of YouTube videos,” she says. Weicker started small, moving from her smoky backyard cooker to a larger one made out of an old tractor-trailer fuel tank. She gave the soap away to family and friends, to volunteer fire departments to test on their trucks, and to horse owners and humane societies to try on their animals. The responses helped her refine the formula. Once word got around Polk County High that the English teacher was driving around on inexpensive, home-brewed fuel, cost-conscious students—including ones who had joked that her car smelled like French fries—asked if they could work alongside her to learn the process. Among her first volunteers was the school’s advanced placement chemistry teacher, and together, they designed a semester-long biofuels course for the school. Seeing the interest in and value of the class, the Polk County school board and a local foundation allocated $60,000 to buy a mobile biodiesel education unit that students use as a processor. That was only the beginning of educational initiatives launched by Weicker and fellow researchers. Consulting with sustainability professors at Clemson University and Appalachian State University, she brought in college students to aid the high schoolers. Polk students have traveled with county economic developers to Clemson to learn more about the potential of bio systems and sunflowers, a crop feedstock. And Weiker’s glycerin research at the Catawba County Regional EcoComplex, a facility opened in Newton in 2011, provided lab opportunities for more Polk students as well as undergraduates, graduates, and PhD candidates from four state universities. Meanwhile, back at Polk County High, students now convert cafeteria oil to make fuel for the school’s truck, and the biodiesel class has been so popular that administrators have created an advanced course as well. By 2011, Weicker’s soap-making research proved so promising that she quit teaching to focus on making her products market-ready. And last year, she significantly ramped up production. Warhorse now buys glycerin from Foothills Bio-Energies in Lenoir, where it is refined and trucked a mile down the road to a company that makes her commercial-grade soaps. That business, the Marlin Co., also makes Warhorse’s personal care products from non-GMO glycerin that Weicker buys from across the country. From their initial run in mom and pop stores around Polk County, the soaps are now reaching a wider audience. Lake Lure Marina washes boats with Warhorse. West End Bakery in Asheville cleans with it. The N.C. Department of Agriculture has tested it on its trucks that haul food to state institutions. Tryon International Equestrian Center, located four miles from Weicker’s house, now uses the full line of Warhorse’s products, putting her brand in front of influential people from around the world. Next, Weicker wants Warhorse to be on the shelves of national natural product chains, like Whole Foods and Trader Joe’s, and regional ones like Earth Fare. She’s working hard to go up against the likes of Burt’s Bees and Dr. Bronner’s, and selling at Katuah Market is a start in that direction, she says. At the market, Weicker’s eyes follow people as they move to the personal care section. Her company’s sales have grown quickly of late, and it’s all a bit dizzying; Weicker, still essentially a one-woman operation, seems a little tired. She’d gotten up early that morning, as she has every Sunday for the past several years, to pick up cooking oil from area restaurants. She still makes biodiesel at home, and recently pumped her 15,000th gallon. And she still makes small batches of soap there, experimenting on new products like shaving cream and a hand scrub. LATHER UP Learn more about Weicker’s products at www.warhorsesolutions.com.